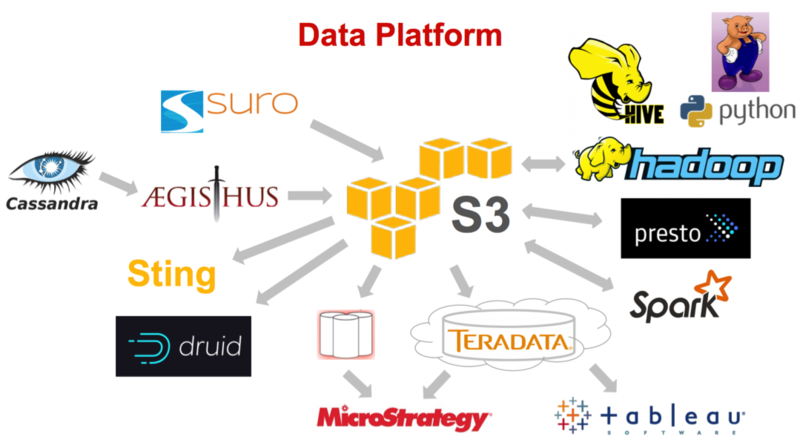 ETL -> Data Warehouse -> BI platform for reporting is currently the mainstream model in most firms. This is typically the state of the art in most large enterprises. The basic objective is analyze subscriber data and viewing data…. Who, What, When, Where, How Long. What is the catalyst for this shift? Complaints about slowness, dealing with data volumes/variety, and the dependence on IT for incorporating changes, has made it necessary for business users to adopt new analysis and reporting tools. This architecture change also allows for multiple ways of interacting with data, including interactive structured query language, or SQL, real-time processing and online data processing, along with its traditional batch data processing. Hadoop gives the ability to keep all data together for shared use and analysis. Apache Hive and Presto are used for running ad-hoc, lightweight aggregation and interactive analytic queries against Hadoop data sources. 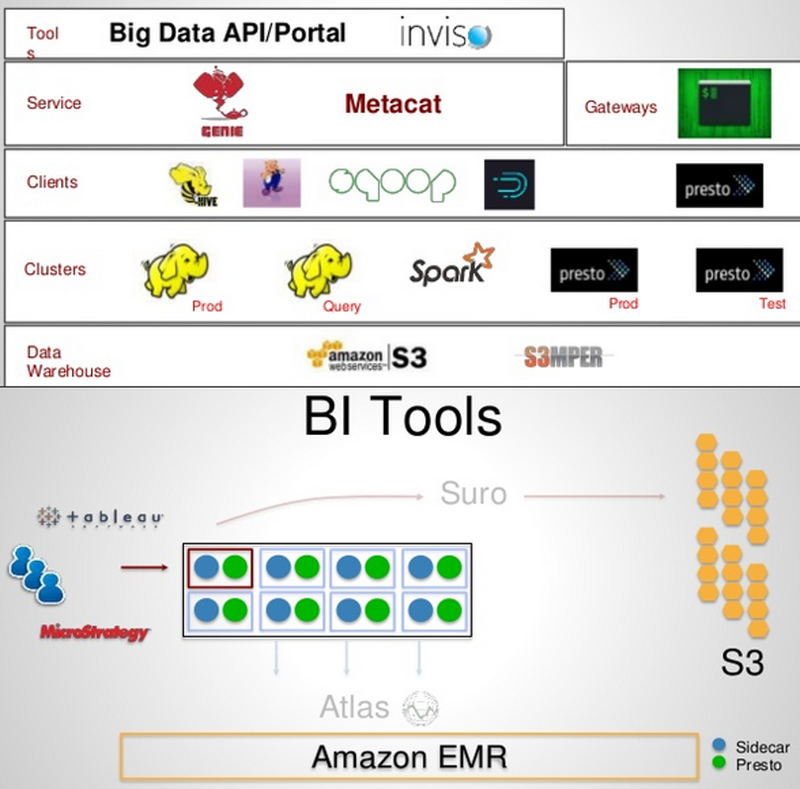 Just to give you a sense of what the bleeding edge firms are doing with Hadoop. At Hadoop Summit 2015, Twitter in their presentation claims to have 300+ petabytes in their Hadoop cluster. They also have multiple 1000+ machine Hadoop clusters. Hadoop clusters combine commodity servers with local storage and an open source software distribution to create a reliable distributed compute and storage platform for large data sets scalable up to petabytes, or PBs, with thousands of servers or nodes. The future increasingly seems to have some variant of Spark complementing Hadoop. Applying machine learning to Big Data in Hadoop is something firms like NetFlix are moving to clearly. This means grabbing data, analyzing it, creating a model and using it for predictions. The future around process seems to incorporate Spark. Spark is an in-memory analytics replacement for iterative computation frameworks like MapReduce; both employ massively parallel compute and then shuffle interim results, with the difference being that Spark caches in memory while MapReduce writes to disk. Spark offers a simpler programming model, better fault tolerance, and is considered more extensible than MapReduce. Spark is any form of iterative computation, and it was designed to support specific extensions; among the most popular are machine learning, microbatch stream processing, and graph computing. Makes sense. Being a data leader requires a mix of cultural bias, team structure, innovative tools and leadership to make it happen. Analyst question: From a product standpoint, you obviously refreshed the interface for laptops and PC. What are the big things you are thinking about? Where do you go from here in terms of product priorities as you move into 2016? Reed Hastings – Netflix, Inc. – CEO — “with a massive move from linear programming on to the Internet…. The core is really continuing to improve the personalization. Being able to more and more accurately present content on the screen whether that’s a TV screen or phone screen that a consumer is just very motivated to click on and watch. We’ve seen tremendous benefit as we’ve done more and more of the big data work. More detailed Netflix stack and BI architecture. Netflix has two things that are working . One, launching new shows that have become great brands on their own. But also as these shows grow into their second and third and fourth seasons, they’re actually more attractive on their own. So adding more breadth of content, more original series, and those series have become bigger and bigger brands that become subscriber events as they grow. Analyzing viewing data…. Who, What, When, Where, How Long…. Since 2008, Netflix streaming has expanded from thousands of customers watching occasionally, to millions of customers watching billions of hours every month. Each time a customer views, Netflix gathers events describing that view – both user-driven events like pause and resume, fast forward and rewind, and device-driven events like network throughput traces and video quality selections. To organize, understand, and create value out of these events, Netflix has built a data architecture to process all these events. Hadoop has crossed the chasm, to use Geoffrey Moore’s term, from early adopters to mainstream adopters. Every major corporation is building some variant of a Hadoop Managed Services (HMS) platform as a service. According to a study conducted by Allied Market research, the Hadoop market is expected to grow from $2B in 2013 to more than $50B by 2020 with a CAGR of 58.2 percent over that time. Spark was originally developed at UC Berkeley in 2009. Databricks is the firm commercializing Spark. Spark was initially designed for interactive queries and iterative algorithms, as these were two major use cases not well served by batch frameworks like MapReduce. Consequently Spark excels in scenarios that require fast performance, such as iterative processing, interactive querying, large-scale batch computations, streaming, and graph computations.